I have learned a few lessons during this ride to LA with Jennie Dickenson and Jenny Barker. Carrying a JBL 612 12 inch loudspeaker, a cello, a tent, a camping mat, a sleeping bag, clothes, loop pedal, cables, mic stand, batteries, plus chargers, odds and ends, etc is too much for me to carry alone. I haven't weighed it all but, I estimate that it weighs about 150 pounds. That's as much as I weigh. 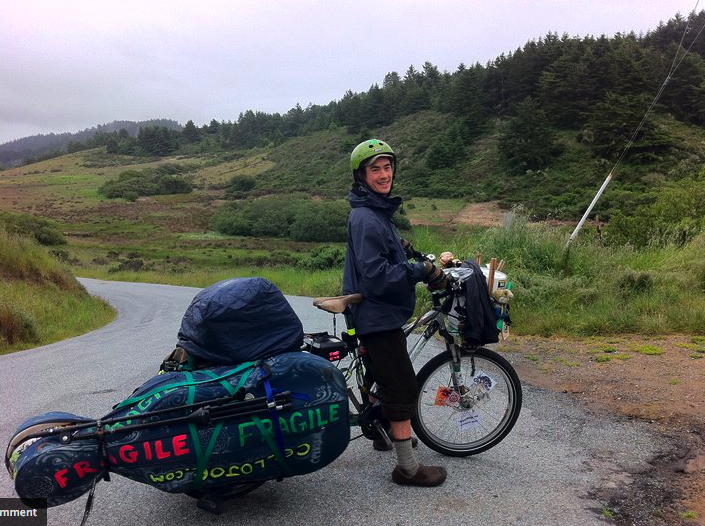 On Monday May 16, we rode from San Francisco to Skylonda and guerilla camped under an awning in the rain across from Alice's restaurant. We rode along the Crystal Spring reservoir on the San Andreas Bike Trail and the Sawyer Camp Bike Trail. Beautiful ride. It's the same way I went in 2007 with the Pleasant Revolution, except there was a bridge out and we had to take a detour near 92 this time. When we got to Woodside, we stopped in at Buck's Restaurant and I mentioned that I had met Tyler, the owner's son, in SF. We asked for a bicycling discount and they filled up our tupperware containers full of chili and clam chowder for free! Wow, thanks! Going up Old La Honda Road was very difficult. We stopped for a break in a driveway, totally exhausted. Within five minutes, a sheriff came and checked our IDs to "make sure we weren't ax murderers." We met a lady named Janelle who stopped her car and got out and said her kids wanted to give us granola bars. We told her our plan to go to Alice's and when we got there, they told us that Janelle had called and that she had offered to buy our drinks! Thanks Janelle! We got up early Tuesday morning to a light mist and rain. We rode to Applejacks in La Honda. All downhill from skyline along hwy 84. Great way to start the day. We got an "Applejack" apple cider with yukon jack and I ran into Kevin the owner. 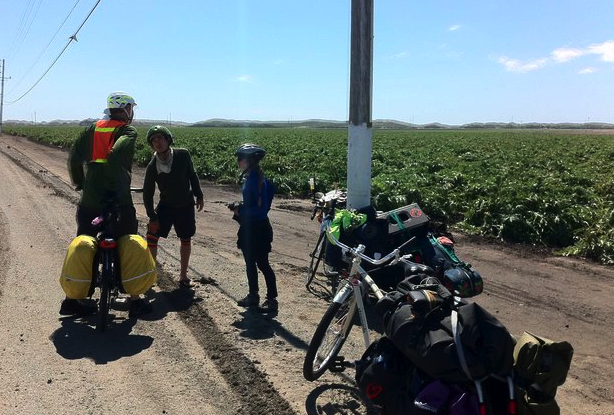 After our morning eye-opener and a warm alcohol buzz in our bellies, we set off to ride up Pescadero Creek Road. It was tough, but not as long as Old La Honda. The rain picked up as we descended the other side and was stinging my eyes as I bombed down the hill. "This is kind of dangerous," I thought. "I should probably slow down." We stopped in at Fly Girl Farm and said hello to Airielle Love. Check out her stand at the Half Moon Bay Farmer's Market and the Pacifica Farmer's Market. We went to the Pescadero Gas Station Taqueria and they filled our container with rice, beans, and salsa for a few bucks. Awesome. We took Cloverdale Road for a nice shortcut to highway one and we made it to the ocean! Yeah! Plus, the rain let up and we had a nice rainfree ride and were able to listen to music on the PA. We made a pit stop at the Swanton Berry Farm stand to get out of the rain and ate some cheese cake brownie with a chocolate covered strawberry on top and truffles too. Then right through Davenport and we made it to Santa Cruz where we knew we had a hot tub waitin for us at Jenny Barker's house. When we got into town we rode up to Another Bike Shop and I was able to fix a bolt in my seat that I had neglected to fix since when I was in Europe last summer. They helped us even though they were closed and they even gave us beers! This was when I realized that my phone was sitting in a puddle inside my raincoat pocket. It is now pretty much dead. I've tried drying it in a bag of rice for a couple days and it seems like it is toast. Bummer. So expect less mobile uploads from me! We got sort of a late start on Wednesday. Jen Barker joined us. 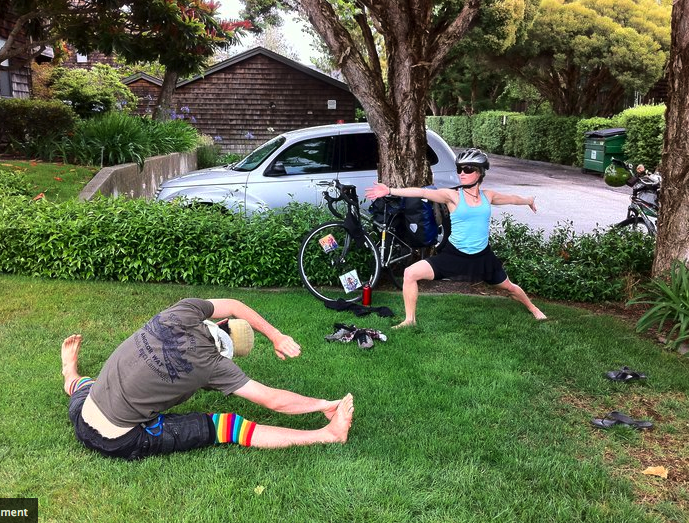 Stretchbreak! 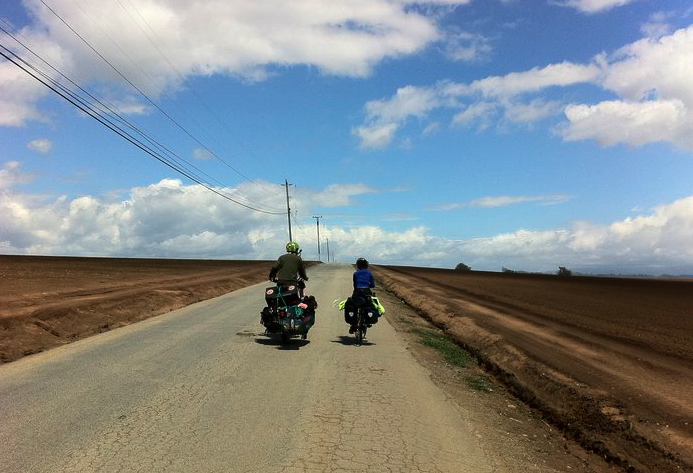 We enjoyed a leisurely ride through watsonville and strawberry fields forever. We met Tim, The Bike Rambler along the way. He had a neat setup. We eventually got to Monterrey and rode along bike paths along the ocean for a lot of it. We guerilla camped in Veterans Memorial Park up in the hills about Monterey. There's always one last hill at the end of the day. On Thursday, we woke up and went to a cafe to charge phones, ipods, etc. 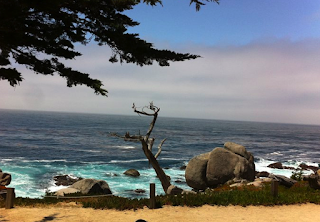 We got advice to ride around the monterey peninsula. It's the same way I went in 2007 with the Pleasant Revolution and we took 17 mile drive along the coast and through Pebble Beach. Truly one of the most beautiful rides ever. Eventually, we got to Carmel and did some research into whether it was possible to get past the landslide on Highway 1. Closed to all traffic. So we rerouted around it and ended up having a good time in Carmel Valley. Joseph Nichols invited us to camp at this house and we had a good 'ol time drinkin wine. nice information about the ride to LA ... looking all the stuff you provided here.I think it's awesome you're sharing your experience in such great detail. CelloJoe schedule at Lightning in a Bottle! Another Bike Shop in Santa Cruz is awesome!